It was just last week that I was speaking to my sister-in-law, and other family members, about pulling back on the iPad with the kids. Then I saw, Tia Mowry posted a link to the Mamabee blog on her Facebook page, about a study that proves the technology we are exposing our kids to, can be detrimental. My husband already hates that the boys have so much access to iPads, phones, etc. His rationale is, they are boys, all the radiation on their laps and private parts, you can guess where this is going! As much as we tell them, place it on a pillow or don’t put it too close to their eyes, how much can we really control their behaviors? My love for the iPad, is duh, its a tablet that changed the way we can view the internet, social media, etc. I remember getting the first ever iPad in 2010, my oldest son was about one. He immediately took an interest in it, and actually quickly was able to maneuver his way around the tablet. As he got older, I started adding apps on it for him, then he learned YouTube, the rest is history. When the third generation of the tablet came out, circa 2012, I purchased it as a gift to myself, after working on a big project for ESSENCE Magazine. This new version of the iPad, was slimmer, faster, brighter and I bought more storage. So, I passed down my first iPad to the boys solely for their own use. The iPad became a crutch for me. I was able to get so much work done around the house, take a break from “motherhood”, cook, wash my hair, whatever I needed to do, and have them sit quietly, I would say, “Go and get the iPad.” Now they are saying we can be harming the kids. Recently, my five year old son, was told he needs glasses. 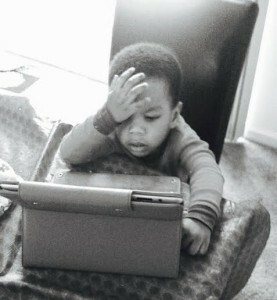 Immediately my mother guilt kicks in, is it because he was exposed to the iPad from an early age? Who knows, but I am definitely more conscious of how long, and what they are watching. We are now reading more books in the 3TheChicWay home, doing puzzles, and playing more board games. As with most things in life, everything in moderation! I am not in the position to tell any one how to raise their kids, or judge any parent. Parenting is hard, and you have to do, what’s best for your family. I am simply here to open your eyes to new research and how it can affect our kids. Do with the information as you please. Link to the article is here, I would love to hear your thoughts on this, Tweet me @3thechicway and let’s further discuss this topic!